Once, years ago, while I was teaching, I was telling my class a story that had to do with my personal life -- something about my family I think; some funny incident. A student said, after the story (I can still see his face -- and I remember his name: Curt): "You're a pretty happy guy, aren't you?" Reflexively, found myself wanting to correct him: Well, I wouldn't say "happy"... Heaven forbid people should think I am happy. There is not a whole lot of dramatic value in being a happy person, is there? And, as an artistic dude, I almost felt, at that moment, that I had shirked my movie/play/novel-established responsibility of being tortured and conflicted. "Yeah," I said, almost apologetically. "I guess I am..."
I think of Adam Duritz, the singer/lyric writer of Counting Crows. Somewhere on their album Recovering the Satellites, (which I love, by the way; I like most of that band's stuff) he utters the line "we're so ___ed up, you and me..."
Lines like that always embarrass me a little. It seems like such a plea for recognition: Look at me! I'm Hamlet! But I have been in that midset, at least for short periods. As a younger guy, I remember walking out of movies, in which there were maladjusted musical characters, holding temporary delusions. 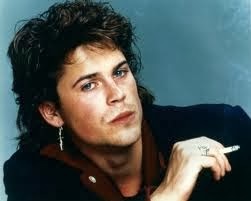 I remember Rob Lowe's character in St. Elmo's Fire, for instance) and wishing, in some dark way, that I could be like that and garner the admiration of friends for seeing me as this talented soul whose distinct difference (nay, sensitive superiority!) from the rest of the world leads him down the dark road to negligence and self-destruction. Poetic ne'er-do-wellism, if you will: uncombed hair, alcohol abuse and the like. Then, that would go away, when I would return to my house with two great parents; a sister who (I guess) looked up to me, and a really cute dog (Foffy rocked.). We ate dinner together almost every night and even played board games together, sometimes, on weekends. I even happily went on beach vacations with them, well into my twenties. (I remember a college girlfriend saying, deeply disapprovingly: "You went down the shore with your parents?" Now, here I am: happily married, living the old suburban life. This is not supposed to be okay; not for a musician and composer and writer. Maybe that reluctance to appear happy comes from the fact that we arteests are different and don't always "fit in." But the thing is, my "struggles" tend to happen on the inside and, sadly for a world with an eye for drama, they don't manifest themselves in self-destructive behavior. 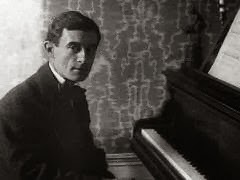 When I was fifteen and would listen to Ravel and Debussy, there were many nights that, owing to my immature and insufficient attention to the study of music, I would bitterly weep myself to sleep, feeling overwhelmed with the desire to make great music but being unequipped, in terms of the skill. This may not seem like a big deal to some, but for someone who burns with the desire to compose, it is a kind of torture. (Oh! Cool! I was tortured. Whew.) There were other things...but I won't bore you further, because that would blow my whole point. Now? Yeah, I am happy, mostly. But philosophically going one's own way does lead to moments of feeling isolated. I just don't want to whine about it in public or in my lyrics. And, you know, if I feel isolated, as lame as it may seem, it's nothing a cuddle on the couch with my kids, wife, or even the dog can't fix.